Halloween is less than two weeks away! With a jammed pack schedule, it's hard to find time to come up with the perfect costume. 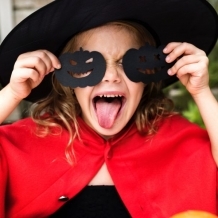 Never fret, we are here to give you Five Super Easy, Budget Friendly Halloween Costumes! 1. A fish is always a hit! This costume only needs a few things, but is so adorable. Head over to Alpha Mom blog for the full tutorial. 2. A little boy who loves Toy Story or GI Joe, will love this Army Man Costume! Gather up a few thrift store finds and some green spray paint and you're good to go! 3. Wine & Glue has the cutest Minion costume ever! Want to know what's even better? You only need a few things to make it happen. 4. Bring a bit of history home with this Lady Liberty costume! Grab your little one and have some fun whipping this up together. 5. A play on words is perfect for this holiday! Fall in love with this Deviled Egg costume from Woman's Day.